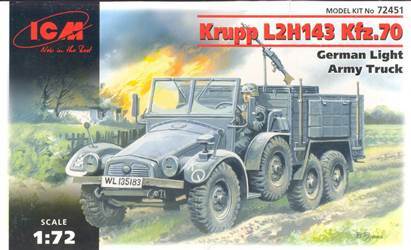 We already have a construction review of this kit by Francesco Giovagnorio and of the sister kit, the Krupp L2H143 Kfz.69 with Pak36, by Al Magnus, while a preview can be found here. For that reason I will focus only on same salient points that I encountered while building this kit myself. The kit is very fragile, both due to the nature of the plastic and the tiny size of the parts. Add to this that some parts have flash that needs to be removed and you have a recipe for a headache. Assembly is rather difficult, due to the parts lay-out, lack of locater pegs and confusing instructions. Some small details are missing (already mentioned in the other construction reviews above, e.g. tow hooks, mudflaps, width indicators, turn indicators, rearview mirror). As I was building a very late war vehicle, I thought I could get away with this. I did add the licence plate to the front bumper, though. Sink marks are visible in some areas. The MG is poor to say the least. The windscreen is a (fragile) plastic frame with a clear sheet that needs to be added to the rear. As this didn't look very convincing in my eyes, I tried to make inserts and failed miserably. I tarped over the windshield and folded it flat as the next best thing. There are no instruments on the dashboard, neither in plastic or decal form. I made mine from punched discs with decals from a set for aircraft instrument decals from APC Decals. Even though I am sure I installed the driver's compartment where it should be, the cargo compartment sticks out too far to the rear. Optically, an easy remedy is to just extend the tow hook to the rear so at least it sticks out from beneath the cargo bed. The wheel hubs are separate, which should have been nice, if they hadn't been so fragile. They are all marked A27, while those for the spare wheels are clearly different. I have no idea what parts A15 are and where they should go. Both halves of the engine radiator are slightly different. You can see through the engine compartment around the front wheels. I blanked this area off. The driver's seat are separate parts. Easy too paint, but a bit too wide to fit. Parts B10 (which I think are fuel or oil tanks) are provided twice. Most period photographs show only one fitted. The exhaust pipe was replaced with something sturdier. 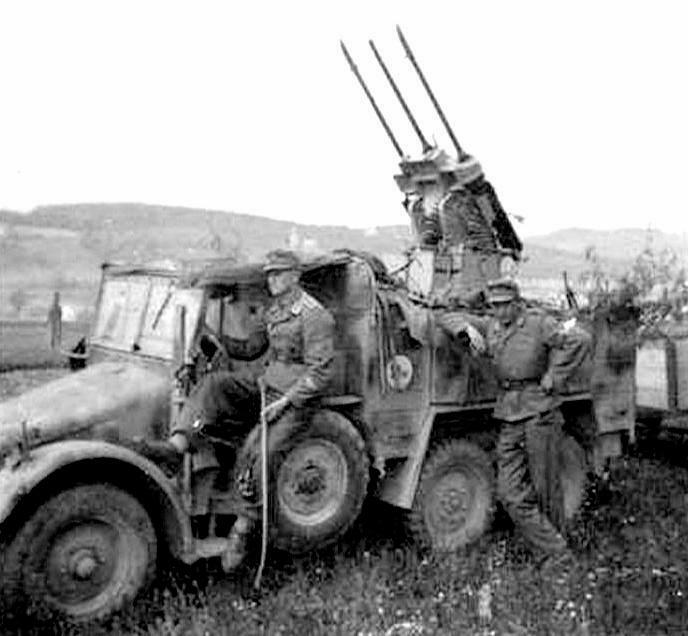 I decided to try to replicate a late war vehicle as seen in the picture below, without trying to stick too close to the original. For that I used the new CMK Drilling set, which has already been previewed here. As noted in the preview, this new set is a major improvement over the previous attempt by CMK. Nevertheless, some remarks can be made. The attachments of the shoulder supports are too fragile and best replaced by something more solid. In step 3 of the instructions the guns are shown upside down. Nothing wrong with that, just be aware. Assembling the gun feed and ejector channel in this phase might make it impossible to install the guns afterwards as these parts might interfere with the frame. Waiting until the guns are installed on the frame first might make it impossible to attach these small parts afterwards. The gun barrels are very thin, perfectly straight and hollowed out at the end. I've never seen such perfection in resin before. Adding the PE parts for the straps to the ammo cases is very delicate work. I would have been willing to trade in some detail if these straps had come molded with the boxes. Given the exquisite detail that CMK has been able to accomplish on other parts, this would have been a very acceptable alternative. The new CMK Drilling set is a very nice representation of the Drilling gun with a lot of potential and highly recommended.